TSI Workspace specialises in creating offices that people want to work In by providing commercial office furniture solutions that deliver enhanced efficiency and employee wellbeing. Introducing the Orangebox Cwtch high back sofas are a succinct sofa system available in low, midi and high back configurations, and designed to facilitate the creation of exciting, workable sociable clusters and landscapes of soft seating. The cool and elegant Cwtch sofa makes a dynamic architectural statement. Californian cool style comes to the UK! Here’s a recently completed bespoke conversation pit for a cool workspace…now that’s teamwork! If you would like something like this in your office please contact us! Own the co-working vibe in your office! The Frovi Relic Cloud is a versatile range is a natural choice for any co-working environment, creating collaborative spaces for agile working and social exchange. Relic fuses together rustic detail and industrial inspiration. Bringing together warmly finished wood and well-worn metals, creating a look that’s comfortable, inviting, and on-trend. Modus Bob Stool – Michael Sodeau’s Bob is a simple stool made from recycled cork. Reminiscent of Gormley’s clay folk in a ‘Field’, the stools have two finger holes so they may easily be moved around, these holes add a sense of character to an otherwise simple silhouette. Designed by Broome Jenkins and engineered to Boss Design’s exacting technical standards, AC are an elegant height adjustable meeting tables that fit effortlessly into today’s workplace. Designed to address the changing landscape of the workplace ACDC will transform the way you work. One all-encompassing table range, enabling both individual and group work. Practical and versatile, this robust functional Jennifer Newman mobile table addresses the need for tall work surfaces whilst the heavy-duty locking castors provide effortless mobility. An excellent choice for office breakout spaces, creative studios and teaching spaces, the Huddle Table offers complete versatility and is ideal for spaces where layouts are constantly changing. Need to Make a Call? Go that one step further with the TP3 telephone pod. With its acoustic panels not only providing a high acoustic barrier, the vinyl panel option also allows you to use the panels for your own design and creativity. The Foundry Coffee Table is made from raw industrial rebar material for a truly industrial finish. Beautifully practical pieces, easy to move around the workplace. Tables tops available in natural oak, with black frames. A selection of RAL colours are also available for the frame upon request. Keyn to Grab Yourself a Bargain? Due to a recently cancelled order we have 12 of these fantastic chairs available in stock to buy now. We have 12 chairs available, in 6 different colours (2 of each colour as shown in the swatches above) and all the chairs have Graphite bases, frames and arms. PLEASE BE ADVISED THAT THESE HAVE NOW BEEN PURCHASED. The Rise of Resimercial Design – The Urban Sofa range is available in three different sizes, from a single seater to two and three seater options. Available with optional contrasting buttons and a choice of natural or black oak legs. The seats are deep foamed with webbed seat and back for additional confort. 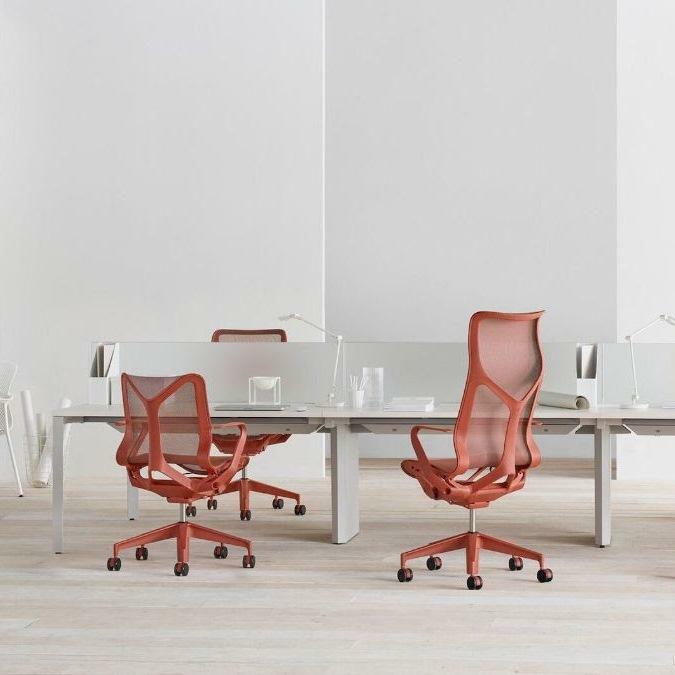 TSI Workspace are proud to announce that we are now official dealers for the iconic ergonomic office furniture and accessory company Humanscale. Click HERE to see a sample of Humanscale products which we can supply. Office Refurbishment – Is Your Office in Need of a Refresh? Call the Specialists! Don’t let your office give you the January blues this year! Why not let us give your office a new lease of life, from vibrant reception areas and classic meeting rooms to state of the art agile working solutions. Whatever you need we have an office refurbishment solution for you. Speak to to TSI Workspace today to discuss your office refurbishment requirements, or click HERE to see a sample of our projects. The Axyl range is based around an inverted Y-frame – which gives each product both a high level of structural integrity and a unique design language. The triangular elements have been engineered to provide maximum strength with the most efficient use of materials. As a result, the Axly collection has a distinctive, instantly recognisable silhouette that is made familiar through its reference to a traditional A-frame typology and subtle details inspired by Mid-Century design. Sit in Cosm, and you just might forget you’re sitting in a chair at all. Its sophisticated ergonomic design instantly responds to your body, movement and posture to provide natural balance and total support. The Famiglia seating family includes a collection of low, mid, high back and lounge chairs that between them offer a choice of metal or wooden legs and 5-star bases. These are complemented by a range of occasional and light work tables for informal or formal needs. Mango by Boss Design is a new personal workspace solution, created with head space in mind. Striking the perfect balance between privacy and ergonomics, Mango allows its user to comfortably escape distractions for extended periods of time without the need to leave the room. Mango by Boss Design is available with or without a high upholstered screen surround, with the option of an extended privacy screen for acoustic insulation to minimise surrounding noise levels. A left-hand or right-hand writing tablet on an articulated arm lets the user position work and devices ergonomically, ensuring the user’s physical wellbeing. Integrated power and data options provide connectivity, essential for modern day work and life.